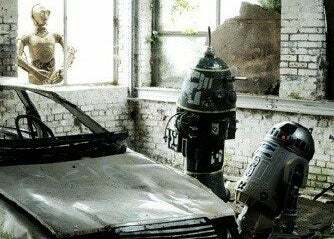 Can R2D2 Talk To An Old Ford Fiesta? It's easy to see why everybody's so crazy for these photos of Star Wars characters in ultra-gritty urban settings. Besides looking incredibly cool, there's something unsettling about seeing Jabba the Hutt in a cracked-out squat, or C3PO in a broken-down garage. The images, by French photographer Cédric Delsaux, show off how harsh and realistic Star Wars isn't. It's not like seeing a steampunk version of the characters, which is still recognizeably fantasy-ish. It's something entirely different. Click through for a gallery.